Discussion in 'Greater Asia & Middle East' started by Picdelamirand-oil, Jun 11, 2015. 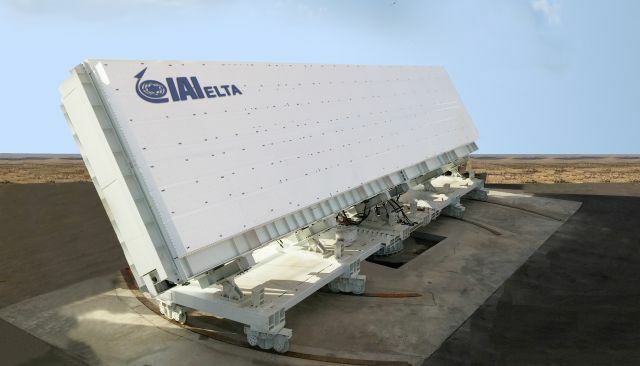 Israel Aerospace Industries (IAI) unveiled a unique, highly advanced family of modular Ultra High Frequency (UHF) Active Electronically Scanned Array (AESA) Radar. The new radar, developed by IAI’s ELTA Systems Group and subsidiary, has a formidable capability of Early Warning and long range search and tracking of low observable Air Breathing Targets (ABTs), and ballistic missiles. The radars offer an advantage of low RCS target detection at long ranges, operation under all weather conditions, and in the presence of dense electromagnetic environments. The ULTRA radar, already operationally proven, uses a modular, common UHF-band cluster architecture capable of wide angle electronic scan in both elevation and azimuth. The basic cluster can be modularly scaled to 6 and up to a 22 cluster configuration which offers extended detection ranges and tracking accuracies. Other cluster configurations are possible to meet specific customer’s requirements.Here. Airpower Australia predicted this years ago. Many laughed but who's laughing now? IAI is selling this? You can have it configured to your needs? That means Israel already has a more advanced version that is classified, already in service and probably already tested against the very best versions of the F-35, F-22 and B-2. The Israelis probably can see what we're doing and how we're doing it whether we like it or not....remember you sometimes develop capabilities to keep eyes on "friends" as well as enemies. Stealth is dead. It had a good 30-40 year run but its an evolutionary dead end. On to the next new thing. It is a common misconception that stealth technology is short live and as radar get more powerful , soon , they will be able to out range weapon engagement envelop , thus renders all money spend on RCS reduction a waste. This impression is inaccurate because any technology that can increase a radar peak power or gain will also benefit a jammers in the same ways. And stealth have a synergy relationship with jamming . A common misconception is that any low-frequency radar can render stealth useless regardless of their transmitting power or aperture size (Ex: Tikhomirov NIIP L-band transmitter on the leading edge of Flanker series are often cited by enthusiasts as a counter stealth system ) , that is wrong however , while it true that stealth aircrafts will have higher RCS in Mie region.It is important to remember that given equal radar aperture area , lower frequency radars will have much lower gain compared to high-frequency radars , thus, they cannot concentrate energy as much and more vulnerable to jamming , lower gain also give them lower accuracy. As a result, most low-frequency radars have much bigger transmitting antenna compared high-mid frequency radar ,it is also the reason that fighters fire control radar still work in X-band, because a L-band , VHF band radars of similar size would be too inaccurate for any purpose others than early warning (their accuracy can be estimated by radar gain equation ).Simulation done by MBDA also shown that despite operating within low-frequency range from UHF to F band , AWACs radar still struggle to detect stealth aircrafts from their frontal aspect. Another common misconception is that the lower the operating frequency of the radar ( longer wavelength ) , the better it would perform again stealth assets , that is wrong, however , as can be seen from table above , even within Mie region , target’s RCS fluctuate significantly and can be smaller than value measured in optical region depending on exact frequency and target size. It is also important to note that if radar wavelength is too long compared to target dimension , it can fall into Rayleigh region , in which target’s RCS can get much smaller than in optical region .